Android Wear is a version of Android that is designed for wearable devices such as smart watches. This section includes instructions on how to install and configure tools required for Wear development, a step-by-step walkthrough for creating your first Wear device, and a list of samples that you can refer to for creating your own Wear apps. Introduces Android Wear, describes how to install and configure your computer for Wear development, and provides steps to help you create and run your first Android Wear app on an emulator or Wear device. Explains Android Wear-specific controls and provides links to samples that demonstrate how to use these controls. Documents in this section cover features specific to Android Wear. Here you'll find a topic that describes how to create a WatchFace. Preview and optimize your user interface for the available screen sizes. Explains how to deploy your Android Wear app to an Android Wear device or to Android emulator configured for Wear. It also includes debugging tips and information for how to set up a Bluetooth connection between your development computer and an Android device. The Android Developer site provides detailed information about key Wear APIs such as Wearable Activity, Intents, Authentication, Complications, Complications Rendering, Notifications, Views, and WatchFace. 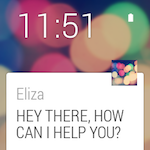 You can find a number of samples using Android Wear (or go directly to github). 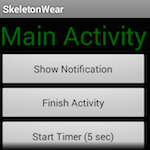 SkeletonWear A simple example of the basics of wearable projects, including GridViewPager and interactive notifications. WatchViewStub A simple demo of the WatchViewStub control that detects screen shape and automatically loads the correct layout. 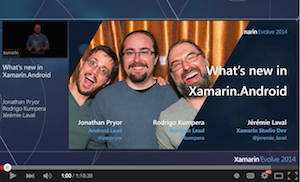 See how WatchViewStub works in the Resources/layout/main_activity.xml layout. RecipeAssistant Demonstration of Wear notification pages, in the form of recipe steps. Notifications are created in RecipeService.cs. ElizaChat Fun sample of interacting with a "personal assistant" called Eliza, using Wear interactive notifications to create a conversation using canned responses. GridViewPager GridViewPager implements the 2D navigation pattern, where the user swipes vertically and then horizontally to navigate through options and content. WatchFace WatchFace is a custom watch face with analog-style hour, minute, and second hands. This sample demonstrates how to create a watch face service that draws the current time and handles ambient mode and visibility change events. It includes a broadcast receiver that listens for time zone changes and automatically updates the time accordingly. Android L and So Much More – The Android L Developer Preview introduced a plethora of new APIs for developers to take advantage of, including Material Design, notifications, and new animations, to name a few. C# is in my Ears and in my Eyes: Google Glass and Android Wear – Wearable computing might seem like something from the future (or an Inspector Gadget episode), but many people are already embracing the future today! 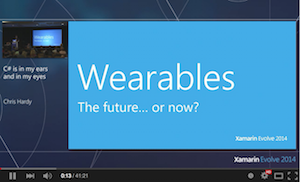 C# developers know this and already have the tools and skills to harness the power of wearable devices (from Evolve 2014). 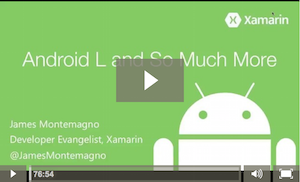 What's new in Xamarin.Android – Android L, Android Wear, Android TV, Android Auto, Material Design, and ART; what does this mean to you as a Xamarin developer? from Evolve 2014.